Convergent Technologies opened its third office in New York City, joining Maryland and Arizona in its most recent expansions into major markets. To meet demand and better serve its partners, the firm has increased design and marketing personnel by 35% over the past year, with plans for further additions in the fiscal year of 2016. 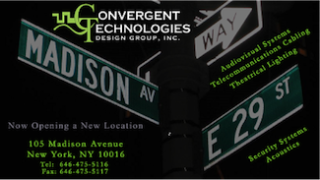 Founded in 1999, CTDG offers design services for AV systems, telecom cabling systems, security systems, acoustics noise & vibration control and theatrical lighting.